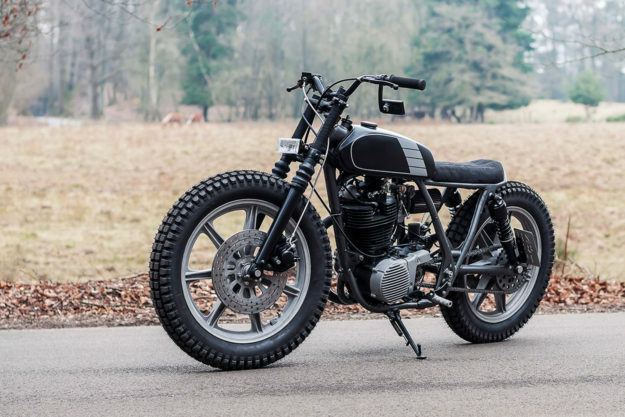 Critics are sure to dismiss this Yamaha SR500 for its lack of fenders, or its trials rubber. But to hell with them. 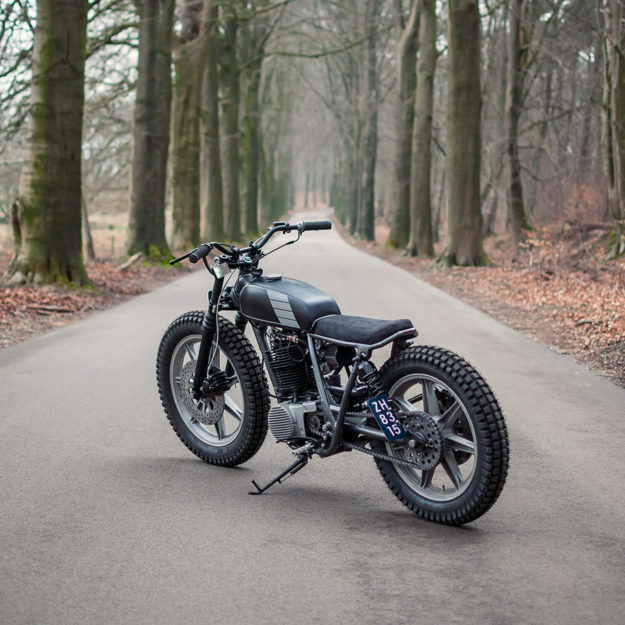 For builder Boy Janssen it’s the perfect country road whip, and it’s crammed with lovely details. 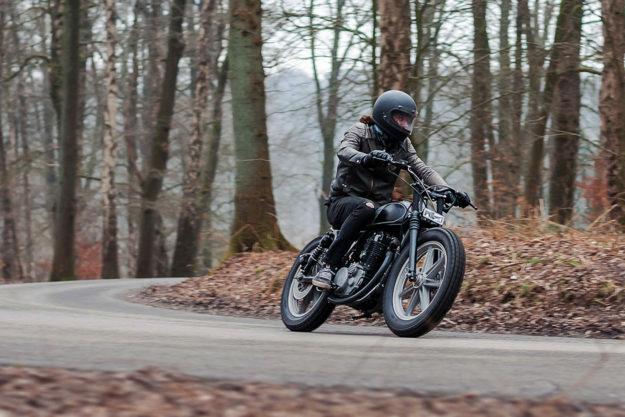 Boy lives in the Dutch countryside, wrenching in his home workshop as Pancake Customs. 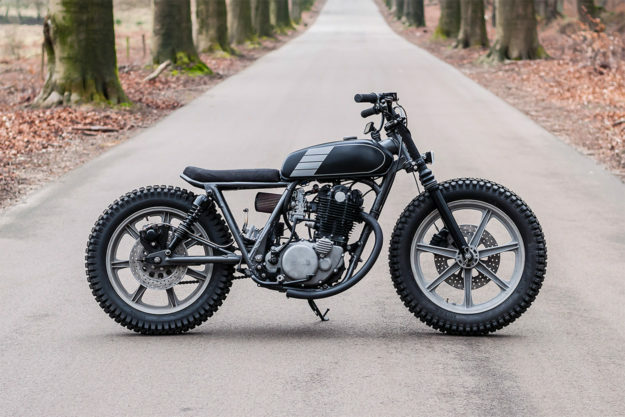 You may remember his Yamaha XT600, built for faffing around in the dunes: Now he’s back with a squared-off 1978 SR500, in a cool modern tracker style. 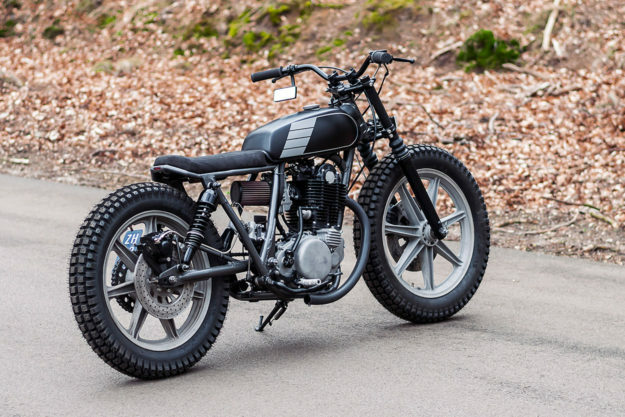 Boy had no clear direction in mind when he started rebuilding the SR500. He just knew that he wanted a clean and minimal tracker of sorts. Once he’d fettled the tank to fit, Boy moved onto the bike’s tail. To match the tank’s lines, he built up an angular rear loop with an integrated LED taillight. The upholstery—done in suede-style Alcantara—was handled by Amsterdam-based Silver Machine. The frame was shaved of any superfluous tabs, and finished in a two-tone ‘Hammerite’ effect. To tweak the bike’s stance, Boy has rebuilt and lowered the front forks, and replaced the rear shocks. 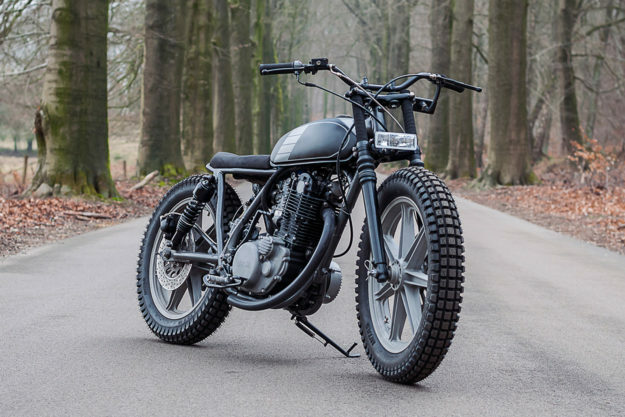 A set of Yamaha XS400 wheels were sandblasted, clear-coated and treated to new bearings. Boy rebuilt the brakes too, and drilled out the rotors. The tires are Mitas E-05 ‘enduro trials’ rubber. Under the hood, he’s given the engine a top-end rebuild, and upgraded it with a high-compression Wiseco piston. 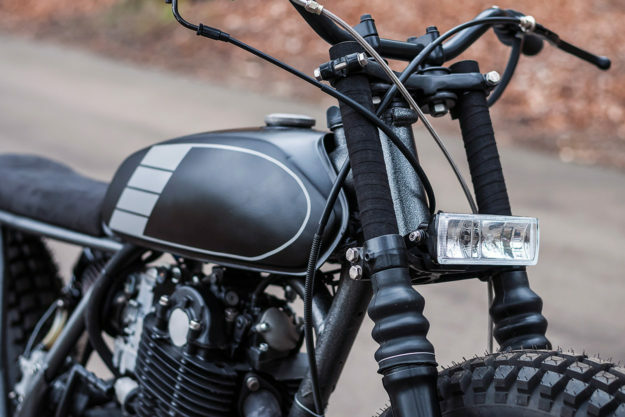 Other mods include a Mikuni TM40 flat slide carb, a new (and very discreet) wiring loom, and a finned magneto cover—to match the cooling fins on the cylinder. 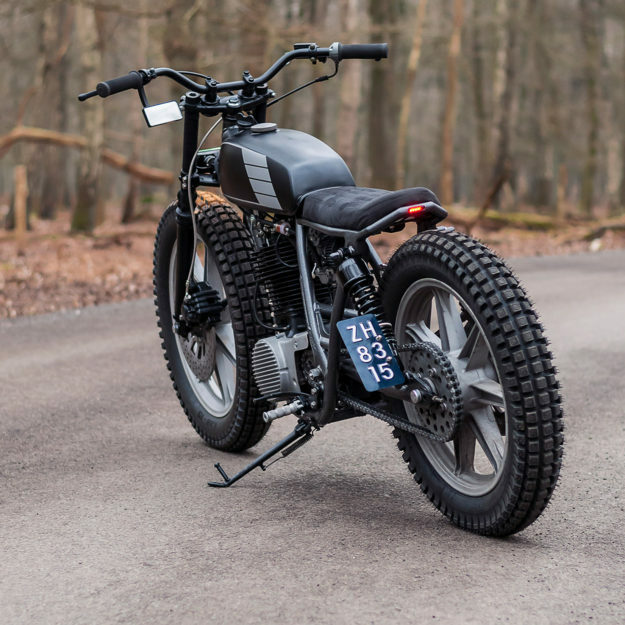 Finishing kit includes tracker bars—devoid of any switches—and Biltwell Inc. grips. The tank is finished in traditional Yamaha graphics in grey, to match the rest of the build. Sure, fenders would be nice, the headlight’s probably not legal, and we wouldn’t want to ride behind that exhaust (even though it aparently does have a baffle). But at least there’s a mirror dangling from the bars. Then again, what more do you want when you’re winding it down a country lane?